Tarpon fishing has been steady the last couple of years, with May and June being the most reliable times to fish. The full moon in May is early this year, on May 10. That should result in decent numbers of fish up until the next full moon on June 9. On and just after the moon the tarpon school up and move offshore to spawn, which means less fish on the beach. The new moon in May is on the 25th. Prime dates in May will be the week leading up to the 25th. The week after that, which includes Memorial Day and the heavy boat traffic that goes along with that, might be tough. Action should then pick up afterwards and will most likely be strong up until the full moon on Jine 9. Book early to get the best dates! 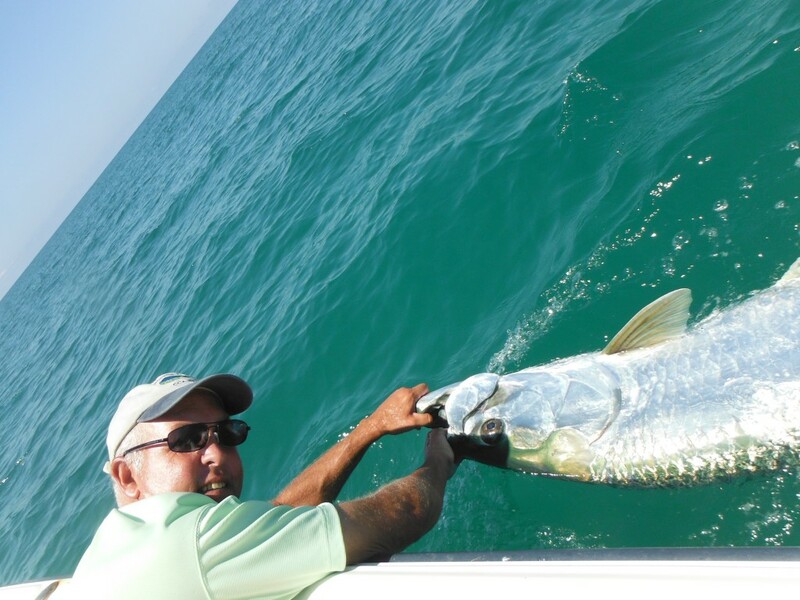 This has been a fantastic tarpon season so far in Sarasota, Florida! Anglers fishing the beaches in late May found the tarpon to be numerous and in the mood to eat. Scott Valentino from Pennsylvania hooked a VERY large fish this morning on a crab. 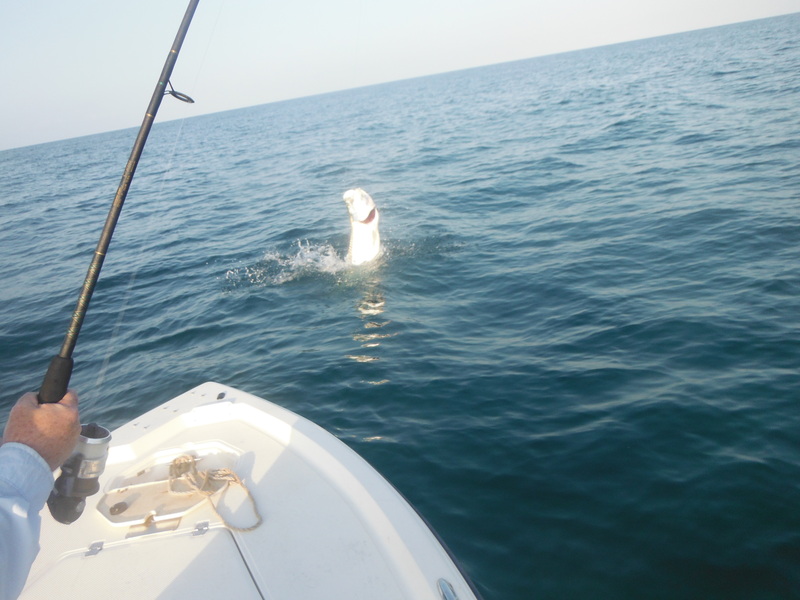 It made to spectacular jumps, then ran for the beach, just about spooling the reel. The tarpon then ran between 2 crab pots, cutting the line; what a fish! Action like that should continue ubntil the ful moon on july 2. I had a couple of cancellations so there are a few days available for those who want to give it a try! 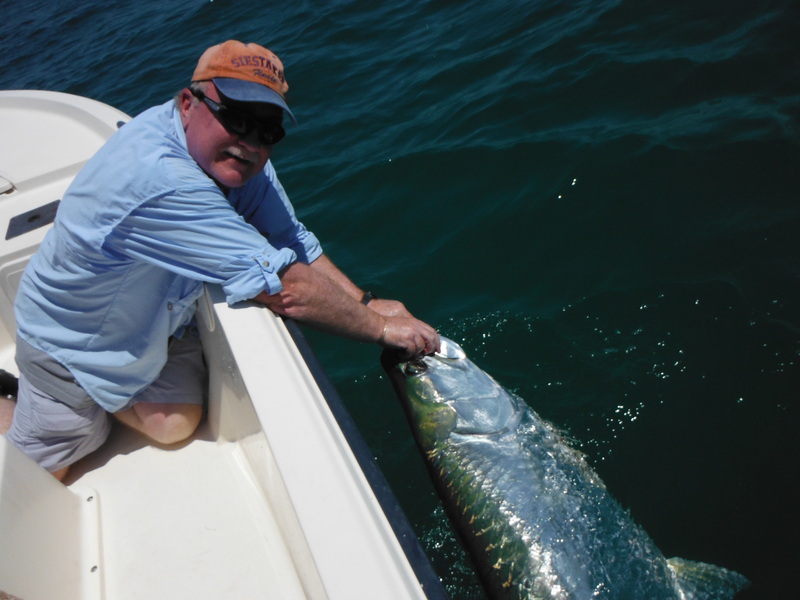 Now is the time to book a Sarasota tarpon fishing charter! These exciting gamefish will invade the area in May and will stay until July. Anglers can use spinning tackle with live bait of for the ultimate challene they can be targeted with a fly rod. Prime dates are still available. The weeks leading up to the full and new moons are generally the best times to fish. The tarpon schools will move offshore after the moon and there will be less fish, though still enough to make it worth the effort. The full moon is on Tuesday, June 2, the week preceeding that date should provide an excellent chance to hook a silver king off of the Sarasota, Florida beaches. The same is true for the first week in July. Fish will thin out after that. Late May after Memorial Day should be good coming off the new moon. Book your trips now while the best dates are still available!